Premier Everyday Soft Marl Yarn - Red Marl - PREMIER YARNS-Everyday Soft Marl Worsted. These yarns consist of two solid colors twisted together to create a marled effect. These marls coordinate beautifully with the solid colors in Everyday Soft Worsted Solids collection. 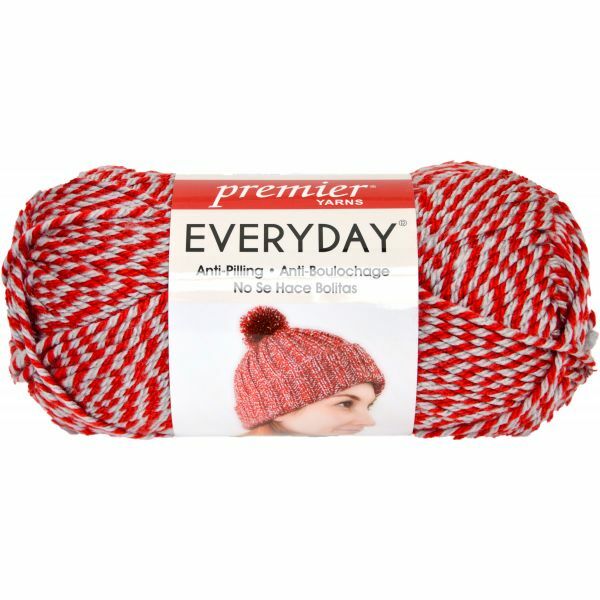 Everyday is made with extra soft pill-resistant acrylic fibers that resist pilling so that your knit and crochet projects look new wash after wash! Weight category: 4, 100% Acrylic, 3.5oz/100gr, 180yd/165m. Gauge: 18st x 24r = 4in/10cm on size US 8/5mm knitting needles and 12sc x 15r = 4in/10cm on size US I9/5.5mm crochet hook. Dyelotted: we try but are not always able to match dyelots. Care: Machine wash, tumble dry, do not bleach, do not iron, dry cleanable. Imported.